Late Victorian architects often considered themselves the rightful inheritors of all historical styles. And many held no compunction about mixing and matching them; resulting in what was sometimes called “a happy mixture of styles.” Nowhere was this more evident than on New York City’s developing Upper West Side. There was no middle man involved in the structures built by Increase M. Grenell. He acted as real estate developer, architect and builder. In 1886 his one-man-show arrived on West 87th Street, between Columbus and Amsterdam Avenues. The 62-year old laid plans for six townhouses, from No 147 through No. 155. Interestingly, he designed five of the houses to flow harmoniously as a near-unit. But the last, No. 155, stood defiantly on its own--a happy mixture of styles. Grenell’s use of rather disparate architectural styles—Romanesque, Queen Anne and Neo-Grec—resulted in a playful yet fashionable home, completed in 1887. Only 16 feet wide, it was three stories high over an English basement. The basement and parlor levels provided a base, clad in rough-cut brownstone, for the red brick upper stories. 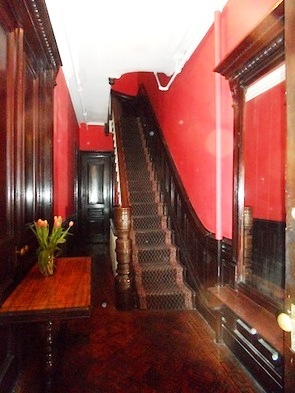 The two-story rough-cut brownstone base had little in common with the upper floors. Here the terra cotta Queen Anne-style tiles contrasted starkly with the Romanesque carving above the entrance. Grenell’s play with contrasts continued with the openings—each floor being treated differently. The arched windows of the second floor were framed in planar stone broken by rough-cut keystones and blocks. Those of the top floor were severely plain. The house was capped by a stylish shallow mansard interrupted by a steep gable. Crisp terra cotta tiles stand in contrast with the rough-cut blocks nearby. Increase I. Grenell had no problem quickly selling the completed house. On March 4, 1887 he sold it to Edwin S. Robinson for $17,500—about $450,000 in 2015. The house was the scene of a wedding on Wednesday, October 18, 1891 when John Robinson’s daughter, Annie Marie, married William Berry Fosdick of Brooklyn. A reception was held later that evening. John and Sarah Robinson continued to live on in the 87th Street house after Edwin’s death in 1897. The title was transferred at some point to Sarah’s name; as was common. Ownership of real estate provided women security in the event of their husband’s death. Robinson was pulled into a messy legal battle in 1903. Years earlier a friend, Henry Wilson, asked him to be executor of his half-million dollar estate. He agreed, although he never actually saw the completed will. Henry Wilson died in 1901 and the two girls were shocked to find that his will had been destroyed. Two years later the case landed in court when Katherine—who was only 19 years old—and her married sister sued their father, Frank, and their uncle for destroying the will. John D. Robinson took the stand, but could only testify to Wilson’s warnings about his sons’ avarice. Close inspection reveals a grinning face in the pendant above the handsome terra cotta plaque within the gable. Robinson still held his position as principal of Public School No. 74 in 1904. The difficult job of running a turn-of-the-century school was evidenced on February 15 that year and it all started when 11-year old Lewis Lucius turned in a report “in a confused condition” to his 6th Grade teacher, Miss Hand. On that afternoon the idea of gossiping while leaving the children alone proved to be a very bad one. The boys were released just before 3:30. A janitor passing by Room 20 smelled smoke. When he rushed into the room he found the teacher’s desk and chair along with the raised platform they sat on ablaze. The wastepaper basket had been set on fire and the flames were spreading quickly. He was able to put out the fire with a “fire bomb,” the chemical-filled glass extinguishers common at the time. Relieved, he started out of the room just as flames burst through the doors of the wardrobe in the rear of the classroom. The Evening World reported “Throwing open the door, the man discovered that this wardrobe had been stuffed full of paper and then set afire.” It took the janitor a full 15 minutes of “the hardest kind of work” to extinguish the fire. In the meantime, teachers herded all the other students still in the building onto the street without their knowing what was happening. John D. Robinson intended to get to the bottom of the arson. “The two fires were so palpably incendiary that a rigid investigation was made by Principal John D. Robinson,” said the newspaper. He interviewed every child who was kept after school or who was anywhere near Room 20. Finally it was Peter Doyle’s turn to be interrogated. Under questioning, he broke down and pointed the finger at Lucius. “He said that Lucius told him that a fire would give them all a vacation, and it would be a good way to get even for being kept after school,” reported The World. Lewis Lucius, predictably, put the blame on Doyle. “I did it, but I didn’t mean to hurt no one. A big boy told me it would be a good way to close the school and so I piled up the paper and set it on fire.” He was arrested and arraigned in the Children’s Court. Robinson finally retired at the age of 72 in the fall of 1903, after serving as principal for 57 years. A year later, in December, between 300 and 400 of his former pupils hosted a banquet in his honor at the Waldorf-Astoria. Among the successful men who attended were millionaires William R. Grace and John D. Crimmins, several doctors, at least two senators and prominent educators. On June 16, 1909 The New York Times reported that Sarah F. Robinson had sold the 87th Street house to Emily L. Langdon. Emily quickly resold it to Dr. William L. Bailey who announced his intentions “to occupy” the house. Bailey was 53-years old at the time of the purchase. Born in England, he was a member of the faculty of Bellevue Medical College. He and his wife, Jennie, lived quietly on West 87th Street, their comings and goings only sporadically appearing in the society columns. Little changed to No. 155 West 87th Street for 20 years. That would change on July 1, 1950 when “Ellen M. Daily and her family” sold the house for $18,000 to an investor “who plans to convert it into apartments,” as reported by The New York Times. Today there are 10 apartments in Increase I. Grennel’s somewhat quirky rowhouse. Rather astoundingly, interior detailing in the common areas survive; and the exterior remains greatly unaltered. It is a delightful example of a time, especially on the Upper West Side, when architects liberally dipped into a grab bag of styles to produce eccentric and wonderful hybrid structures. 10 units? As in rooming house? The Dept of Bldgs describes them as "apartments." At 16' wide, I cannot imagine what the accommodations are.